Any issues that I should be aware of on the proposed loop.. Poratge changes, low water, etc..
Let us know how the trip goes when you get back. I only saw 10 people on the whole loop and 8 of them were on the first day.. I have been through the South Muskego a few times now, and enjoyed it every time. Here is a loop we did this spring. This was a great route with some beautiful and remote travelling. Simonb, which colour is your route? Temagami_Glenn, which route did you take from Eagle to Anima Nipissing: Whitewater or Harris? I added a green line that denotes the route we actually did. We did the loop in 6 days with 1 day fishing exploring Goodfish, Sugar, Angler. We didn't put in a lot of time travelling each day as the snow usually convinced us to sleep in. The portages through Sugar to Isbister were very seldom travelled. we couldn't find any sign of the last 750M one through to Isbister and had to head straight through the bush. It was an exhausting 3.5 hour push. We also decided to cut straight through Isbister to Turner on our last day as we were running out of time. We've done the route from Sirdevan to Isbister before, but not from Sirdevan to Turner. We didn't want to risk coming across more non-existant portages on our last day. I'll probably put in another trip to check out this link next fall. 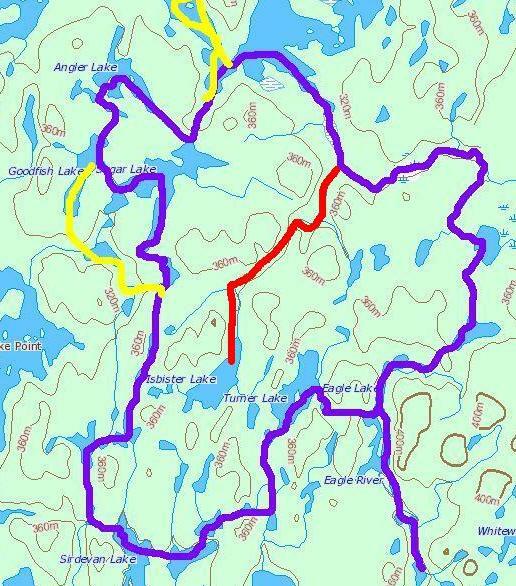 I also forgot to check for the portage on Lady Evelyn for the creek route to Barter (red line on map). I'm curious to know if this creek is traversible similar to the Muskego route. Where is the Harris route??? What do you think of that trip??? Do you mean Stull? We did an amazing week long trip across Solace, Lady Evelyn, Muskego a few years ago. We flew into Scarecrow, paddled down the Sturgeon River, across Solace Park, through Florence Lake, down the Florence and Lady Evelyn Rivers and across the Muskego to Anima Nip. On that trip through the Muskego, we took the "Harris" route which is through the North end of Eagle lake, Shallow Lake, Harris Lake into Windy Arm of Anima Nipissing. Brian is away for a few days and will probably answer you when he returns. What was your exact route? Skull is a great trip (everywhere, almost, is a great trip) with a trip up Maple Mt thrown in. The low point, I think, is the Montreal River. Does anyone think this would be inappropriate to travel late October? I hope you plan on lining, walking and portaging a lot!! I would say you need some water, May to late July at the least. This route, but skipping the river? Actually, I was recently informed that the water levels are higher than August levels. 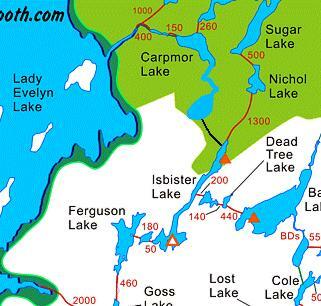 If I was going to travel in late October, I would select a route that was less isolated than the Sugar Lake route into Isbister, Barter and Turner... if that is what you are contemplating. For 2 main reasons: 1. Parts of the route see little use. 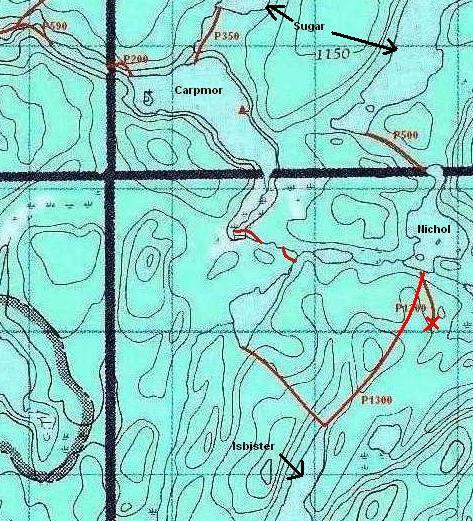 The section from Sugar thru Nichol and into Isbister then across to Barter and into Turner are Nastawgan portages that see little to zero maintenance. If you are experienced in locating these types of portages and following them then go for it. 2. Parts of this route, including the section from Isbister to Barter require you to walk thru water for a significant distance. You will get wet and need to watch out for hypothermia especially difficult if you are travelling alone. I think it could be a good trip, but you would need to be well prepared for the weather. We found that portages from isbister to eagle were all quite good, but they are not well marked. You have to train yourself to look for axe blazes, then you'll be fine. If you wear rubber boots and take it slow you can keep your feet dry, but there is definitely a good possibility of getting soaked. Be prepared to change if soaked to avoid getting too cold. We did have trouble coming from carpmor thru unamed lake into Isbister. Travel was good right to the unamed lake, but we couldn't find the nastawgan from the unamed lake to Isbister. The Muskego river is a very nice paddle, and with all the rain over the last few weeks, it might be high enough. Was the Isbister-Nichol-Sugar lake travel OK? Sorry for the multiple messages, but I think muskego/Sugar is the best bet for me. You wouldn't happen to have your itinerary, would you? I probably would not do any of them in late October when weather conditions are so transitional. If I wanted to canoe during this period, I would probably choose a route through the larger lakes or a river and stay away from the smaller lakes and creeks. The larger lakes could pose wind problems with driven ice pelletts and below freezing conditions. You could start from Sandy inlet and go across into Diamond and then through Bob Lake to Obabika. South on Obabika to Obabika Inlet and into Devils Bay and across to Ferguson Bay. An easy trip in the regular Season, but plenty stressful in late October.Also, some small lakes... Bob, Mud and Shish Kong to negotiate and they may have ice on them in the early morning. You would probably not see a soul after you left Sandy Inlet except maybe some moose hunters. Anyway... whatever you decide to do.. have a safe trip. I haven't done the portage thru Isbister-Nichol-Sugar, as we took the route thru carpmor. I imagine it would be better than the route we took as it is on the maps. Our longest day was day 4, having to bushwack the portage into Isbister took lots of time/energy. Young Loon to Sugar was a long day as well, but thoroughly enjoyable paddling. Since you didn't use the active route Sugar-Nichol-Isbister, then did you cut the portages from Carpmor to Isbister? There were existing trails, albeit overgrown, from Carpmor to the last lake before Isbister. Unfortunately, we didn't have time to cut trail that day to Isbister. When we got up that morning it was snowing pretty heavy, so we went back to bed and didn't hit the water until 11AM. We quite literally put our heads down and went through the bush. It was early spring so the undergrowth hadn't come up, and the trip was easier than it would otherwise have been. Our route took us virtually straight up the hill and down the other side. The first half of the uphill was quite thick, and would take a few hours to thin down. The second half of the uphill was thinner, but had some very steep sections. The downhill section was good travelling, and quite open. I think we may have been on a well established game trail. Well worth it, as Isbister is a beautiful, and secluded lake, with a very nice campsite on the point at the south end. Nothing like an exhilarating bushwhack with a canoe on your shoulders to cap the day.